Solutionz by Chicke Fitzgerald : One Size Fits All: Making Healthy Choices, Stepping into a Meaningful Life- an interview with Michele Howe on EGG Live! 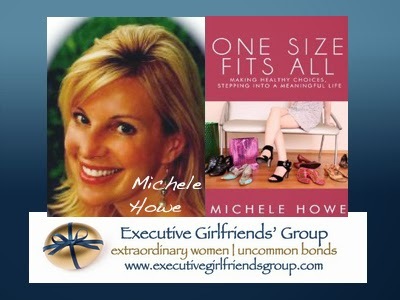 One Size Fits All: Making Healthy Choices, Stepping into a Meaningful Life- an interview with Michele Howe on EGG Live! This on demand audio series is a part of the Executive Girlfriends Group Vignette Series. Chicke Fitzgerald interviews Michele Howe. The original live interview was 3/22/13. This episode is #40 of all time in the top 50 shows on Solutionz Live! Michele Howe is a reviewer for Publishers Weekly, FaithfulReader.com, Retailers + Resources, Foreword Magazine, TeenReads.com, KidReads.com, among many others national and international publications. In One Size Fits All, you will discover that much of life and health is about making good choices. What we say yes to, as well as what we say no to, matters in our everyday decisions. Information, no matter how valuable, remains worthless unless we grab hold of its principles and put them to use in our lives. Each one of us determines the quality of life as it pertains to our health. Throughout every chapter of One Size Fits All, discover how much influence you have over your life despite periodic seasons of setback, illness, or injury. As you read, you will learn how every individual's unique lifestyle plan includes making meaningful choices to build a healthy life. One Size Fits All provides comprehensive prescriptions for life that will encourage, strengthen, and fortify you to be your healthy best: mentally, emotionally, physically, and spiritually. Michele has published over 1600 reviews/articles and has been featured on numerous radio shows across the country speaking on topics such as parenting and a diverse range of women’s health issues. Michele is the author of twelve books for women.